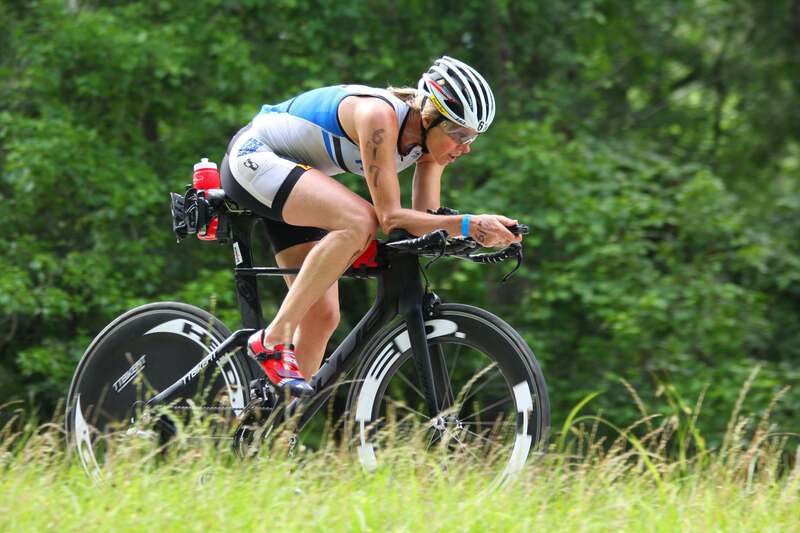 I enjoyed this Ironman and I loved The Woodlands (and The Woodlands loved us back) but if I sign up for a spring race again in hotter than hell territory you can punch me. This was the North American Championships so they would have 2 or 3 Kona qualifying spots in my age group which is more than usual and played into my decision to race here.I traveled alone while Todd stayed home managing work, school, crew practice, regatta, lacrosse, drum lesson, sleepover, throwing food at the kids, the usual. 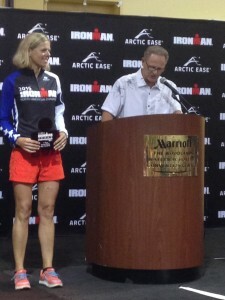 On Thursday I made new friends at the Fifty Women to Kona gathering (www.triequal.com) and had a beer with Susanne Vanzijl who also qualified for Kona (in her first iron!). I ran into lots of TTBikeFit athletes including Chris Montross from CA who won his age group. Fun to put faces with the fits. Friday I did the practice swim and bike/gear bag check-in. Texas rain had transformed the 2600 bike transition area to a muggy smelly mud field. Once the various bags and nutrition paraphernalia are dealt with, it’s just a matter of sitting down and mentally going through every step of next day’s process to make race day happenings automatic.Race morning: upside-downed my bike to drain previous night’s torrential rainwater. The smart thing would have been to attach the shoes to the pedals as transition now was mostly suited for mud wrestling. 81 Fahrenheit water and no wet suit; lined up near the 1:00-1:10 swim sign. Rolling start, I liked it. I thought I had a solid swim but was disappointed to see 1:06 for the 2.4 miles. I later heard there was a current in the 1300 meter canal that might have worked against us. Or maybe I didn’t pick the straightest line; they don’t call me GPS Kenyon for nothing. I felt like a million bucks on my trusty Blue Triad SL but curbed my enthusiasm per strict orders. Indoor riding had prepped me better than anticipated. I chose my LG Course stealth aero helmet over full aero for lack of heat acclimation reasons. For hydration I used my usual Speedfil setup – A2 and Z4 between the arms, R3 behind the saddle. This course favors folks with comfortable fits as you can stay tucked in aero position almost the entire ride. I am back on an ISM Adamo Racing2 saddle – the modern version of the first Adamo I used back in 2007 – and it has been working great as I never need to get out of aero. 30 miles in, our (1/4 mile away) neighbor Patrick McCrann of Endurance Nation passed and yelled ‘this wind is unusual’. Yes we had wind already and from a strange direction which was an indication of even windier conditions to come. I was pleased that there were no packs and my only minor annoyance were a handful of guys who passed me only to relax immediately. Then you have to tap your breaks to slow until you are out of their draft zone and then power up so you can make the pass. Or else just sit up and take care of nutrition or perhaps coast and pee. The possibilities. I was riding a Hed Jet 90 mm front and a rear Jet disk and in spite of the remarkably stable handling of these wheels had a few uncomfortable moments in the gusts. This is a fast course even with winds and uneven road surface. 112 miles 5:07. T2 changing tents never cease to amaze me. 3 ladies busying themselves around me telling me to sit down for my pedicure (those were their words). I didn’t lift a finger and somehow was sent on my way with clean feet, socks and shoes, race belt, FuelBelt, fresh Tifosi sunglasses and a visor on my head. How did they do that? First run loop of three felt super although the heat was burning my face (at 5pm it was 91 Fahrenheit and 90% humidity). The highlight of each loop was the wild and crazy speedo dancers; their energy was contagious. The rain never came. There was ample ice and I spent every mile’s aid station cooling the body and taking care of hydration and salt. Second and third loops got crowded; items were harder to come by while trying to run through. I focused well on controlling my body temperature but retroactively speaking did not take in enough fluids. All of a sudden I was so desperately thirsty I gobbled down everything I got my hands on and immediately got a side stitch. My feet were barely leaving the ground, otherwise called a shuffle. During 10 hours of racing there are details you often don’t remember until a couple of days later. One such was a long black snake at a corner that I almost stepped on but with a leap and shrill scream managed to avoid – generating big laughs from the crowd. The last 10 miles had me question life, the universe and everything. Marathon 3:53. Ugly but could have been worse. Total time 10:16. So hard. Unlike some European races, you don’t receive different color bracelets that mark which loop you are on and for that reason I didn’t know how I had placed until I spotted Jordan Blanco at the finish who verified my 1st in 50-54 (shut up) and 6th amateur. Fantastic feeling and relief! Maybe if I knew I was the overall age group woman leader from mile 3-18 on the run, I wouldn’t have slogged it so much. Yeah right. My body is still not right 6 days later and my toe nails are falling off because my feet swelled. Like one of the motivational signs on the run course: “if it were easy it would be called your mother”. Huge thanks to my brilliant Coach Al, Pursuit Athletic Performance, FuelBelt, VASA, Blue Bicycle, Speedfil, PowerBar, ISM, Tifosi Optics, Trueform Runner and Powerbar. Not to mention my kids for putting up with their crazy mother during another Ironman buildup. Ok, so they get to go to Kona. I think bribery is too harsh of a word for that. And to the world’s best husband, training partner (and bike fitter), Todd – we are going to Kona number 8! Which means the famous super slo-mo video studies of the pro’s bike fits are back!